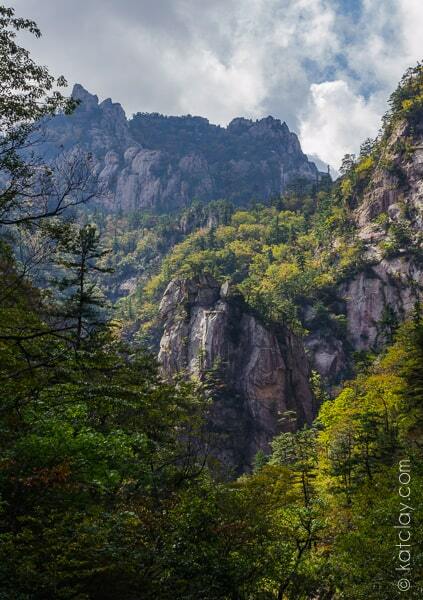 Kat: Seoraksan National Park is the highlight of many itineraries in South Korea. It’s easy to see why, with the crystal clear waters splashing through enormous granite valleys. I always knew I wanted to go there during my time in Korea, and the opportunity came up with the 5 day Chuseok holiday. Seoraksan is a little out of the way. There are no direct train lines to the park; the only way to get there is by car, taxi or a couple of buses. The closest town is Sokcho, in the far right hand corner of Korea. We arrived from Gangneung early on the Monday and hopped on the bus to the park straight away. Already I could see the perilous rock spikes of the park erupting from the forest. Justin: Upon arriving my memories of the American National Parks came quickly tumbling back. This really was a stunning park. Korea is not only blessed with amazing scenery, it’s also blessed with people willing and able to take advantage of the outdoors. Koreans wear trekking equipment like it’s going rapidly out of fashion and at Seoraksan it was actually justified. It’s always great to see so many people taking to the national parks. Age is definitely no barrier when it comes to enjoying open spaces and high hills. It was great to see some light rapids cascading beneath the enormous mountains. It really felt good to be out in such splendour. Kat: Although we’d planned to camp, the campground at Seoraksan is well out of the park. Thankfully, this is Korea. An abundance of hotels, love motels and hostels were at the park gates. Unlike Australia and America, Koreans treat national parks like amusement parks. You can’t go hiking without coming across a restaurant mid-way through your trek. Which is actually not as bad as you’d think, eating Korean pizza (a rice flour pancake) underneath a canopy of elm and pine trees. Or when I ran out of water at the top of Mount Gaji, there was a snack shelter with a nice man to fill up my water! Justin: Everywhere you look there are coffee shops, motels and eateries. It’s a booming economy with many upwardly mobile people happy to spend on services. Yes the conveniences in this National Park were welcome and reflective of how Koreans are masters of making things convenient and accessible for all. Kat: We checked in at the youth hostel, a typically Korean joint with contrasting sparkly wallpaper and free rice cooker. From there we hiked for most of the day; first to the Biryeong waterfall. After the waterfall we stopped for lunch, trying our first ojingeo sundae (squid sausage). The body of the squid is stuffed with rice, tentacles and herbs, then sliced and fried in egg. Delicious. Kat: That afternoon we took the easy way up the mountain: cable car! The cable car runs up the side of the mountain, allowing a particularly vertigo inspiring view of the temple below. Justin: Yes taking the cable car up there was the easy but only way out, or up is it, really. 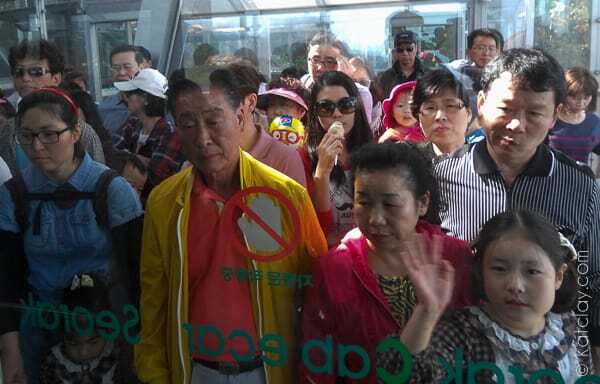 When we where there I caught a sullen looking crowd of Koreans lining up waiting to get into the cable car. The only one smiling was a child looking and interacting with me. Kat: At the top we walked for about 20 minutes to get to the main lookout for Gwongeumseong, where Koreans lounged about in their colour-coordinated camping gear. We rock climbed a little to get to the real summit of Gwongeumseong, although I must admit our achievement felt a little too easy having taken the cable car. However it’s the only way to get to the top of this particular mountain; dangerous rock slides forced the NPS to close the path. If only mountain climbing was this easy! Justin: To get to the top we had to navigate up a steep rocky ares where we got a couple shot – quite a rare phenomenon – and a couple of snaps with the Korean flag. 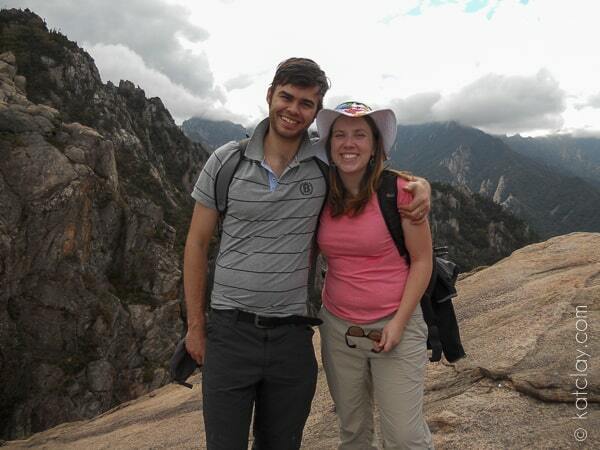 Kat: The next day we decided on a longer hike, up through the Cheonbuldong Valley. The trail winds up along the river, past the Biseondae (Fairy Rock). High above us we could see real climbers doing their business on pitched lines. The water in the valley was so pure, we could see right to the bottom of the pools. In places the Cheonbuldong Valley looks just like a watercolour painting. 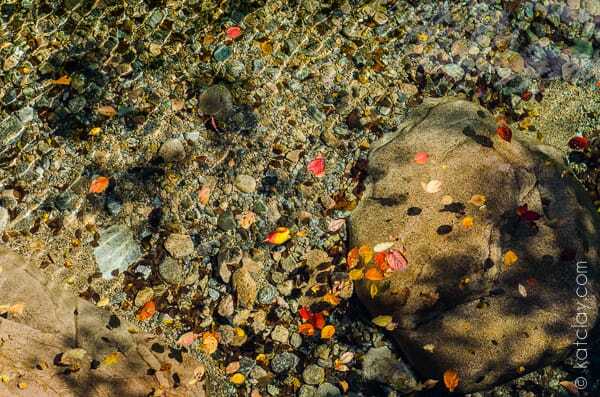 Autumn is the best time to visit – the weather is beautiful for hiking and the leaves turn red. Coming from a country that doesn’t have a defined autumnal season, I always marvel at the changing of the leaves. Justin: I really loved this walk. During part of it I was listening to an audiobook about the theology woven into the Coen Brothers movies. I was also marvelling at how much the wonder of God is carefully woven into nature. I never really liked nature growing up, but as I progress into my 30’s it really is part of me. Nature is able to sooth my soul and quiet my mind. This turned into a long trek, something we needed to do as we start to prepare for more serious climbs in Nepal next year. The changing of the season was beautiful and we really enjoyed getting so much sun and mileage today. I highly recommend going to this national park. 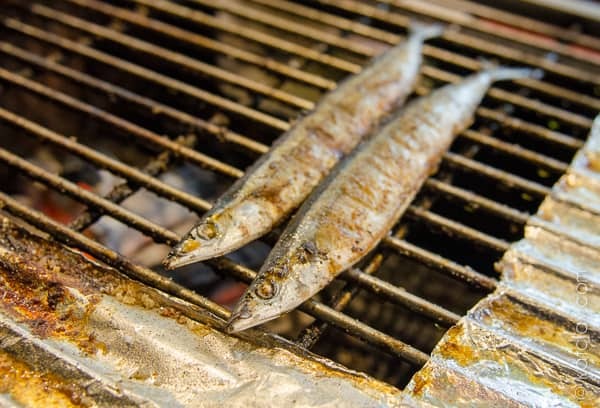 At night we ate a hearty smoked fish meal and enjoyed walking around the village taking clear snaps of the moon and the changing neon colours of bridges and lamp posts, so characteristic of the Korean landscape. From Seoul you can catch a bus directly to Sokcho. The closest train station is in Gangneung. From there you can catch a regular bus to Sokcho, which takes an hour. Sokcho’s local 7 and 7-1 buses go to the park, but be warned, peak visiting periods turn the buses into sardine tins.